Firefly Legal was recently featured in the Serve Report from Serve Now. The article focused on how and why process servers should give back to their local communities. Firefly Legal makes it part of their mission to support their local communities in any way they can. Check it out, and be sure to check in with the Serve Report regularly for awesome industry news and information. It’s a great read! …Here’s the article full text below. items in their Staples for Students drive. There are a number of process serving firms out there that take the time to participate in community events, drives, donations, and more. ServeNow.com is on a mission to highlight process serving firms that give back to their communities. Keep reading to find out how Firefly Legal gave back to communities in several states. From August 15th through September 10th, Firefly Legal offices from across the country joined together to participate in the Staples for Students school supply drive. Staples for Students is a nationwide campaign that encourages businesses, celebrities, communities, and more to collect school supplies to be donated to the communities across the country. Over the two week period, Firefly legal was able to collect over 300 items across multiple offices to be distributed to Staples stores in Illinois, Florida, and Ohio. Firefly Legal Marketing Specialist Stephanie Irvine had a lot to say on why the company participated. 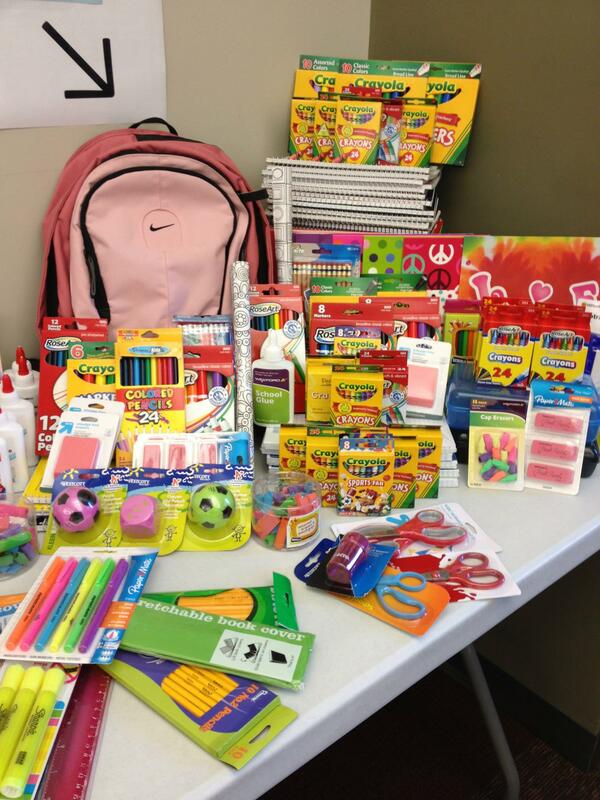 The impact came in the form of 314 total items including crayons, book covers, pencils, papers, backpacks, and more. But this isn’t the first time Firefly has given back to the community. In November of last year Firefly’s Tampa office participated in a food drive for Tampa Can Do Attitude. Most recently Firefly Legal donated computer equipment to Trinity Services, a non-profit organization that supports disabled individuals with educational programs, services, and counseling following an upgrade of company equipment. The donation included 15 flat-panel monitors, 12 computers, 5 laptops, and a server. Irvine closed by noting that the Firefly team was joined together for the benefit of communities from Fort Lauderdale to Chicago. “The drive allowed all of our offices to unite on a company-wide scale, but still contribute to their local communities.” Irvine says that although Firefly Legal is a national company, they’re still local guys at heart. Know a Process Server Who is Giving Back? Let Us Know! ServeNow.com is working to highlight process servers that are giving back. Has your process serving firm or a process server you know gone above and beyond to help your community? Contact ServeNow today and share your story! After a recent upgrade, the IT department at Firefly Legal found themselves with a lot of operable computer electronics in good condition. The options were limited: to retire the wares to a technological graveyard or find something else to do with them. Since the items were still functional and only slightly out of date, the IT department took the opportunity to find them a new home. The perfect fit came with Trinity Services, a local non-profit organization that helps people with disabilities by providing a myriad of support services, including educational programs, therapy, and counseling. The donation to Trinity Services included 15 flat-panel monitors, 12 computers, five laptops, and one server. Chief Information Officer, Clifton Dillman, headed the donation efforts. Director of Day Programs and Behavior Analyst at Trinity Services, Inc., Tabitha Schafer, was thrilled about the donation and commented, “The server will be used on the business side, but the other materials will go directly to the clients.” She explained that the laptops will be extraordinarily helpful to those with limited mobility. For example, some of the clients at Trinity have restricted limbs or are in wheelchairs where they cannot easily access the computers. The desktops will open up more learning opportunities because new programming can be installed. Prior to the donation, the computers that some of the clients used were outdated and limited the options of what programs could be used for learning opportunities. Schafer explained that the computer donation will be immensely helpful, both with the current software used and additional services that will be offered to their clients. The donation, valued at nearly $10,000, marks the beginning of a great partnership between Trinity and Firefly Legal. Firefly Legal is happy that not only is there a place for the electronics to go, but that the donation is truly going to benefit a member of the local community. This certification is similar to the well-known SSAE 16 certification, which is a certification audit that more closely looks at financial reporting. Historically, this certification was reserved for those in the finance industries; however, the critical need for quality assurance in all industries has caused the certification to evolve and move beyond just the finance industry to incorporate and serve anyone needing quality assurance in their operations. By obtaining this certification, a third-party company, Frost Cummings Tidwell Group, will be evaluating our processes to make sure that we meet or exceed the industry standards to protect our clients’ data by measuring security, availability, and confidentiality. Aside from the extensive and thorough background checks, rigorous pre-employment screening, and stringent in-office policies that Firefly Legal has always implemented, we feel that this certification will add an extra layer of protection and peace of mind for our clients. Our top priority is providing smart services that are reliable, confidential, efficient, and effective. We take pride in being an industry leader that you can trust. At Firefly Legal, we do more than just provide services to our clients, we build relationships. And we’re never going to leave you in the dark. Headquartered in Mokena, Illinois, Firefly Legal is a national associate legal services company specializing in process serving, skip traces, court filing, document retrieval, and loss mitigation. Firefly Legal’s Director of Client Relations + Business Development, alongside Vice President Matt Massa, attended the Mercy Housing’s 2012 “Moving Forward Together” fundraising and neworking event. The event was geared around raising awareness of the housing crisis in Chicago. Mercy Housing is a national non-profit organization that helps to build or preserve homes, create jobs, and prevent homelessness. The goal of this years’ event is to fulfull the ten-year Moving Forward Together campaign, which is to build or preserve 7,500 affordable homes, create 8,000 jobs, and prevent homelessness for 20,000 in the Chicago and Milwaukee regions. As a sponsor of Mercy Housing, we at Firefly Legal feel it is important to do our part to help those who can make a difference in our community. Check out some of the photos from the sessions and panel discussions in our photo album! Sweet Home Chicago – Back from the Atlanta ALA! Now that we’re getting settled back in the office, we finally have time to reflect back on the fantastic trip to Atlanta, GA for the Association of Legal Administrators (ALA) Region 2 Conference. The conference couldn’t have gone better; the weather was gorgeous, the accommodations were luxurious, and the sessions were well attended. The conference was held at the Loews Atlanta, which had a lovely rooftop deck and an elegant conference floor. With multiple sessions on communication, organization, and human resources, operations, and business management, there was plenty of knowledge to soak up! The conference keynote speaker, Craig Price, provided an informational and fun session on working with people with “Learning from All Sides.” The exhibit hall was buzzing with activity all throughout the morning, and there were plenty of opportunities to meet and talk with the folks who attended. Tim Barker from Frost Brown Todd LLC won a $100 American Express gift card in our exhibit booth raffle. As usual, we had the opportunity to meet a lot of new people. We also enjoyed catching up with those who we hadn’t seen in awhile, too. This conference really provided a prime opportunity for networking and information sharing. Follow Firefly to the next conference, NYSPPA, on October 12th, where you can meet our Ohio Manager, Phil Data. Jenn and I will be headed to Baltimore, MD for NARCA on October 18-19th, 2012.